Comment: Two story vinyl siding with brick facing that needs to be sealed. 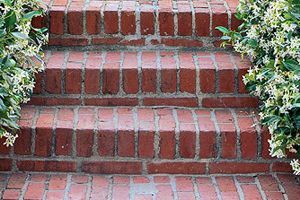 Comment: I have a small area of my brick walkway that is sinking and needs to be re-set/repaired. It is right in front of my main entrance to my house and not safe to walk on. Comment: Small area of brick walkway sinking and needs repair. Comment: Would like an existing patio redone. Needs elevation above ground for water run off. Approx 12x12 wih an additional 3x5 walkway. Comment: Under deck, drainage and cement and some type of landing at the bottom of the steps. Comment: I have a firestone wall on my garage that adjoins a sidewalk. There is loose and crumbling mortar on the bottom where it meets the concrete walkway that needs to be repaired / replaced. Byron Center Brick & Stone Masonry Contractors are rated 4.55 out of 5 based on 85 reviews of 6 pros. Not Looking for Brick & Stone Contractors in Byron Center, MI?